Our team at Harris Porsche wants you to be safe on the roads and to have information on all the latest safety features available. When you think of auto safety features, auto-dimming rearview mirrors likely aren't among the first things to come to mind. Considering they can help prevent the blinding glare from following vehicles, a glare that can impact your vision and reaction time up to 1.4 seconds, auto-dimming rearview mirrors merit a closer look. 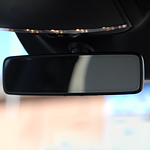 Using ambient light sensors in a process called electrochromism, auto-dimming rearview mirrors detect intense glare from following vehicles and darken the mirror to protect your vision. When the light's detected, a charge is sent through electrochromic gel which then darkens the mirror and restricts the amount of light to protect your eyes. Learn more at Harris Porsche about auto-dimming rearview mirrors and other available vehicle safety features today.